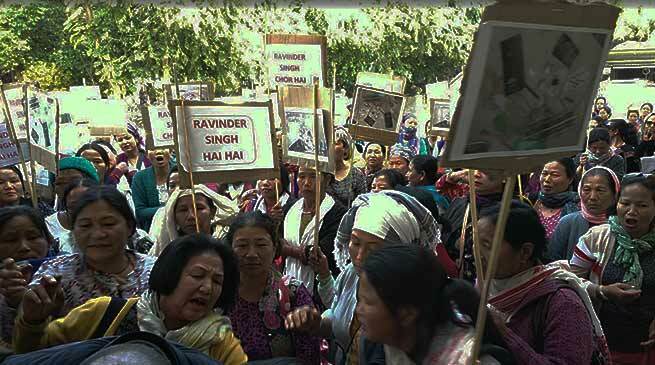 The Women Against Social Evils of East Siang District, Arunachal Pradesh, which has been fighting tooth & nail against the rampant prevalence of drugs and other illicit substance menace in the district and its neighboring districts and adjoining Assam villages, carried out a peace rally and gherao Pasighat police station on Saturday in protest against two police personnel who were alleged of having nexus with drug peddlers. The WASE team has alleged that, two police personnels, namely, Sub-Inspector, Ravinder Singh and Asst. Sub-Inspector, Kitam Jamoh, IRBn have dubiously disappeared some seized drug items of opium balls. WASE President, Ome Ering said that, on 2nd January night one drug peddler was arrested by police on tip off and initiative from WASE team. Some of the seized opium balls were found missing next day while making the seizure list. When WASE enquired about the missing opium from the police custody, SI Ravinder Singh shouted at them challenging can’t be done against them. “We had also lodged a complaint at SP Pasighat on 3rd January, but no action were initiated till date, so we are compelled to carry out the protest rally demanding suspension of two erring police personnel as both Singh and Jamoh have direct and indirect nexus with the drug peddler”, added WASE President, Omem Ering and General Secretary, Joya Tasung Moyong. While another active member of WASE, Yamik Dulom Darang alleged complete negligence from police in dealing or tackling drug menace in the district. More than hundred women folks from WASE gathered at Pasighat PS today and demanded for suspension of both Singh and Jamoh. After former Education Minister and present INC State Vice President, Bosiram Siram and present Pasighat East MLA, Kaling Moyong assured supports to the good cause of WASE, SP Pasighat, Prashant Gautam put SI, Ravinder Singh and ASI, Kitam Jamoh under suspension until reports of an independent enquiry are not placed. While talking to Media over the issue, Bosiram Siram said that, erring police personnel if found guilty have to be suspended. “If police involves in such anti social and drug peddling/addiction activities, whom shall the public rely upon? WASE are doing good works and as there is no smoke without some fire, WASE’s demand has to be considered and an inquiry has to be made against the two police personnels”, added Siram. While, Pasighat MLA Kaling Moyong said that, he has suggested SP and DC Pasighat to take immediate action against the police personnels and to this regard, SP has suspended the erring police. When contacted, Supt. of Police, Prashant Gautam confirmed the suspension of two police personnel. “I have written to DC Pasighat for an independent enquiry about the matter and until the reports are completed, the two personnel have been suspended”, added Gautam was seemingly unhappy and discomfort over the two police personnels who brought the Pasighat police under bad light.